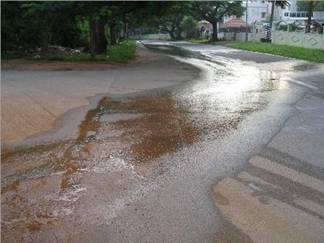 BHAMY V. SHENOY writes: During the last 19 years, I must have helped several hundreds of consumers with their water problems as a convener of the Mysore Grahakara Parishat (MGP). I must have devoted hundreds of hours to helping find medium and long-term solutions to Mysore’s water woes. But when a water crisis hit my own residence last month, I was helpless. We suffered for 19 gruelling days with water shortage. As a result I have better appreciation for the kind of problems we Mysoreans face if we do not act now on a war footing to confront the impending water crisis. Of course, poor slum-dwellers have have become immune and those who have bore wells are well protected. Here is my sad story of restoring water supply which took 19 days to resolve. To my misfortune, it turned out that the bore point was 70 feet from the meter and far away from my house. It took the better part of one day of digging to locate it. They found that it was blocked. When it was cleaned, I started to get water supply only near the meter, but not in the sump. The water inspector suggested that my 20-year-old pipeline was corroded and needed replacement. There were two sections: one under the road and another on the footpath in front of my house. It was decided that only the footpath section needed replacement. After a day, he brought a plumbing contractor who was ready to do the job for Rs 2,500. Since I did not feel he was professional enough, I contacted another contractor through a friend of mine. He agreed to do the job for Rs 1,000. Though I was surprised by such a low bid, I did not doubt about his expertise since he was working at my friend’s factory. From my conversation with him, I learnt that he had had very little schooling, he had done similar work for more than 10 years, that he was not a registered plumber, that he worked under the wings of his registered brother, etc. He completed the job of replacing the pipeline in a few hours. But there was no water the next day. It was already 10 days since the start of the water problem. When I called the contractor to share my problem, he was in Tirupati and would return only after three days. He agreed to send his assistant, another person with little schooling. He came and tightened the fitting. Still there was not a single drop in my sump, but a lot of water was still leaking on to the road. Each morning, I went through the ritual of inspecting the sump for water, calling the water inspector, telephoning the plumber, etc. This drama took place for three days. Finally, I realized that the plumber had connected the inlet from the mains to my earlier discarded pipeline. Therefore, the water, instead of going into the sump, was going to the road. Finally that was set right on August 1. Still, water did not gush out of our taps the next day either. Now the water started to leak from the section of the old pipeline under the road. When the plumber worked on replacing the pipeline, he had mishandled it to damage the older pipeline under the road and it had now started leaking. This time I decided to go along with the plumbing contractor recommended by water inspector. His charges were Rs 2,000 and I had to agree. But there was another problem: I had to get road cutting clearance from the Mysore City Corporation. When I went to the MCC office, I was asked to get the application submitted by the plumber and was told that it would take few days to give the clearance. When I explained that water was leaking all over the road, it did not make any impression. When I told him that I would go to his boss, he was upset with me and told me that he has not even asked for a bribe and why I was being rude. Finally, I called the Assistant commissioner and he gave me oral permission for the road cutting over the phone. The second plumber promised to come on August 5. At the appointed time when he did not show up, I called him only to find out he had gone to some other place to work even after he had told me that he had left for my house. Thus it was one more day without water and one more breaking of promise. Finally, he replaced the pipeline with the help of five people. Four of them were new employees he had picked up to cut the road. His plumbing expert also had no schooling. I insisted that no plumbing work would be done without the presence of the contractor. Finally water started to come on August 7, exactly 19 days after my first complaint. I am now trying to find out how I can pay the road cutting charges and it has turned out to be an even harder task. If the VVVW had competent employees, I would have got the correct diagnosis of the problem and my problem would have been solved within days. They had no idea where the water mains and bore point were. But for the timely assistance by the assistant commissioner, the MCC staff would have delayed my repair work by some more days resulting in more loss of water and more problems for me. The most glaring lesson for me was the absence of competent, professional plumbers. I wonder how many residents suffer like I have silently when all this can be easily avoided by having an autonomous body to look after a city’s water supply. Just look at how long it takes to get an internet connection repaired which is definitely not as important as getting water supply. We also need a body which trains professionals like plumbers, electricians, painters etc and certifies them. Above all, we, as a society, need to realize that we have water crisis today and it will only get worse. The Jawaharlal Nehru National Urban Renewal Mission (JNNURM) provides funding. But it does not provide experts; we are expected to assemble the management. This entry was posted in Issues and Ideas, Mysore-Bangalore and tagged Churumuri, Jawaharlal Nehru, JNNURM, Mysore, Mysore City Corporation, Tirupati, Vani Vilas Water Works. Bookmark the permalink. ← Can India pull off an opening ceremony like this? Not sure if i have to sympathise with Bhamy for his woes or get annoyed with Water Board morons for being irresponsible. Does somebody have Manivannan’s email id ? May be this post should be mailed to him. Don’t pay road cutting charges, just get the cut repaired properly with concrete! Just today Water Board’s people came for Meter Reading after EIGHT months. This is the way the Board is working. Leaking pipes, irregular supply of water, timings which are very inconvenient for the public,etc not one complaint …If Chescom spoils 50% of the peace pf the public the remianing work is done by the other boards. God only should save Mysoreans! It is America who sent man to the moon and let us not get confused that India has any part in it! In 1960s and early 70s, Mysore had plentiful water supply, the city was green and was less crowded. As new industries were coming up, Mysore and other cities in India were slow in resource planning and sharing, partly because of the inexorable explosion in population which made the problem size very large, and partly the way politics and organs of local and state government have been working in Mysore and indeed in India. Unlike scorched earth Australia, India does get rain, most of which go as waste and there is no proper planning to make best use of it. But even it did happen, if India keeps on adding tens of millions to its population in each year, a stage will be reached, perhaps less than 50 years, when resource sharing becomes impossible. It is thesame incase of electricians and other building artisans. There is no scientific training available. They all learn while workingas unpaid or poorly paid apprentices to traditional workers who also have come up the same way. I agree with the comment above. As a resident of a small town, I have seen one man play the role of plumber, mason and agricultural labourer! I have had bad experiences too – esp. when it is time for repairs in plumbing & electric fittings (my regular electric repairer is also a barber! ).Nobody opts for these professions, esp. plumbing. How does one lure people into becoming plumbers by choice? sir this is a very important question. we have been discussing this for a long time. as you known JNNURM comes with a set of a mandatory reforms, but they are all on the administrative side and nothing is mentioned about technical and engineering side(loosely its an engineering skill plumbing). i really dunno if any of the plans submitted to JNNURM are verified for technical soundness. i know they outsource proposal evaluation to various agencies, but some evaluations i have read donot critique engineering. For the longest time I have never heard anybody talk about ITIs at all, though I read recently, that the one in gouribidanur got some central funds to be converted to a center for excellence. We have all these grand plans for IITs and IIMs but basic ITI and diploma schools lie there without manpower and resources. bread and butter of any economy. They should introduce an ITI course in agriculture and animal husbandry, with classes in marketing and economics, that will hopefully bring in some money to these schools as an outcome of this hopefully some skilled fitters and electricians can be produced. as you might be aware, a plumber in CT would not charge anything less than 70$ an hour. and he is booked all through the year. you usually have to wait a few days before he shows up. on weekends ofcourse he is out on his shiny ‘little mistress’ cruising the waters of the sound if not the housatonic. In Europe and particularly in Britain, the City and Guilds plumber’s certificate is highly valued. There are associations of professional plumbers who will recommend you a qualified plumber. Certain bank accounts have in-built emergency electricity and plumbling services and the banks supply a list of certified plumbers in the area for the client to contact. I know a number of plumbers in London who earn as much as a surgeon and who operate a very professional web-based plumbing services. The qualified plumber shortage in Britain was so acute some years ago that the plumber-training institutes which offer City and Guilds training certificates attracted good graduates even from the Oxford University. As I said in my earlier comments, the main problem is water shortage in almost all cities in India and certified plumbers can only do so much and cannot improve water shortage at the reservoir end. One should not mix this problem with lack of trained plumber. Establishing training institutes which provides approved plumber training is one thing and persuading youngsters to take up plumber training is another. After all it is not IT training and stigma is attached any work that uses physical force and hands in India. Societal snobbery plays its part. I dont know much about how the syllabus is chosen, but it is strange that such training is missing in our school curriculum, given that some kind of introduction to vocational skills (besides what we learn individually at home), would have helped each and every one of us. rather than water shortage, it is lack of management of exisiting water, source-distribution-utility-recycle that is a problem atleast in bangalore and mysore. by any stretch of imagination atleast in bangalore & mysore are much better placed in terms of water availability than say kutch. and yet we think of water like the kutchis do as a supply problem. acicm laxmana is the man to talk about water in mysore. hopefully, churumuri can rope him in for a piece. from what little i know, i will tell you this, medievals like kempe gowda, without satellite and GIS intuitively, or perhaps through science, knew exactly where to build lakes and ponds. they exactly knew what the bottlenecks and constraints of the region were and literally did the equivalent of bhageeratha prayatna to bring water to bangalore. and yet, all we have managed to do is systematically destroy bangalore’s lakes and water sources and come up with useless BORROWED cliches like water is a problem, 21st century wars will be fought on water etc etc. biLiya kaaNadu namage kaaNolla sari, biLiya kanDiddaadaru namage sariyaagi kaaNbekalve, atleast nammoora kariya kanDiddaadadru naavu kaaNabekalve? screw naaDaprabhu, the irreplaceable gouri satya knows more about drains and pipes in mysore than mysore corporation itself, for otherwise MCC would have not presided over flooding of KR circle year after year. about education, you are considering your own circle of experience. there are so many people who will take up any training that can add value to their employability in a snap. there are all sorts of people with all sorts of aptitudes and calling, even in cities and even amongst the middle class. you underestimate enterprise and overemphasize constraints due to social attitude. social attitude has an impact. but that is just one part of the problem but one which has taken up disproportionate amount of attention. instead wasting energy in chasing people with regressive ideas, i think, energy is better spent in elevating labour, rather than fighting to re-engineer attitudes of regressives. i think resgressives are best made irrelevant. the best way to change societal attitudes is to put our monies where our collective mouths are – the best way to fight prejudice against labour and labour class, is to elevate their skill and trade into an art and a science. instead we spend all of our energy in fighting attitudes in history and social books, and media. instead of fighting the higher battle science-ifying skill, that had greater impact, we are fixated with the easiest of battles and choose to fight the battle of gutter heads. needless to point out, this is a battle with low returns our history has borne this out. i will give you an example. yakshagana. but for the sciencifying of it by Dr. Shivarama Kaaranth, it would have joined the long patronizing list of ‘folk’ arts (what the fukk is a folk art? what are others alien arts?). instead, thanks to efforts of ajja it has pulled ahead today and stands as an equal with the rest of the arts. instead, imagine if ajja had joined the bandwagon of theory-walas , who were by then sitting in plum positions dishing out thesis after thesis on social attitudes. there is an ageing sculptor & painter who runs,what can loosely be described as a gurukula in dharwad . dont think of trees and ashrama. bang in the middle of a middle class layout in dharwad, at a time, he hosts two kids from surrounding districts. he can only afford two kids at a time. he doesn’t take money from them. employs them to fix the pump, run errands and such. dhadd solemagana, yen maDD adi le. etc etc. flow heavy and easy in the compound. he teaches them sculpting and dyemaking and critical appreciation, eye, angle, stroke and all that jazz. but beyond skills, he teaches them business and marketing. the ‘batch’ that was there when i used to visit that house to meet his sons who were my friends are now on their own in bangalore and doing well. last month when i spoke to my friends and enquired about ‘dad’ they were saying that he still gets applicants, but age is catching up with him now. i cite this second example because the ‘school’ is in dharwad, kids from random villages in bijapur and gadag, with no ancestoral background in arts. completely ad hoc circumstances and arragements. yet thanks to ‘sir’, as kids call him, they found a living in bangalore. he ofcourse doesnot pick random kids, the kids are skilled to begin with and have a certain mental makeup. but the point is, he takes pains to visit parents, convince them and spends hi spersonal time and money to polish these raw diamonds. he will die in a few years without awards and academic tenures, and prolly unheralded, but he would have more impact than sundry intellectuals who chime in on human condition time and again. ad hoc arrangements are fine, but what about systematic infra? no need to go world over. learn from kerala. heck, learn from ajja. you would think laying tiles in plush apartments is an unskilled job, but ask around and builders will tell you that there are no local people who have that skill. they have to import people from malaysia and china. there is more to plumbing than turning a wrench. it might not be rocket science, but it is still a science. in anycase, that is a cavalier attitude to skills and education. KA might not have a market but the country and the world is a huge in boom, skilled & trained handymen can find work whereever there are oppurtunities. KA govt.’s, main mandate should be to produce the best plumbers, best turners, best carpenters, electricians, masons, nurses, tailors etc etc … in the world. If KA does not have market. then people will seek out places where there is a market for their skills. quit giving lame excuses like social attitudes and actually do something, beyond making money talking of social attitudes. so far the only thing that the state has managed to do is build a cottage industry based on borrowed angst and fake empathy and built on the ruins of an already devasted industry and people. the only hope is the much despised IT-walas and angaDi walas like NRN, who, in a twist of irony, have developed taste for all that is native and glorious and who buy colonial mansions and in whose foot steps even mysore’s marwadis and rajasthani tradesmen are now known to follow. i hope angaDi types like NRN grow in creed and numbers so that mangalore tile walas rediscover a market that the socialists and equal oppurtunity-walas had systematically destroyed, while actually making their monies talking about the plight of the miseries of the tile-walas. i honestly hope the little known hamlet on the western coast, hangarkaTTe thrives and attracts all the skilled skillsmen from the area and beyond. Postings here are mixing two issues -water shortage or the extent of it and skilled plumbers and the plumbers training and provide pointers with a single solution. Separating the two, first, the stark reality is demand for water has risen exponentially since 1960s and 70s as a result of population explosion. Given the slower increase of water supply or in reality the same quantity of water available during these 40 years which infact ia a net reduction as the population has multiplied, one cannot say there is no shortage of water. It is denying the reality staring at the consumers. Second, the skilled plumbers. Those who dismiss the social attitude that exists in India in respect of manual work is shutting their eyes from the reality. When I last visited Mysore, a brick layer I knew from my childhood wanted his son to take up an ‘office work with computers’ and not continue with his bricklaying apprenticeship. In other words, he wanted his son to move up to become ‘middleclass’ as he put it and not remain for ever in working class as a brick layer. That is reality on the ground. sure number of people who demand water has increased. but so has amount of sources we have tapped into since then. but it is also a fact that 50% connexions in mysore are either faulty or unmetered. it also fact that there are leakages and ineficiencies in distribution. and it is also true that there are inefficiencies in utilization. we can keep on increasing supply, but unless you fix operational inefficiencies you are not going to see much change in the pipes. i am saying before we increase supply, fix existing inefficiencies and extract maximum out of the available water. this is as good a time as any to fix what is wrong with what exists when the water network is relatively small and demand manageable. infact that is the only way out for us. if i am not wrong, something like .87 tmc is all we have for all towns between bangalore and bandipur. our population will keep on increasing, how much water will we keep on pumping from the river? at the same time TN’s population will also keep on increasing. do you remember last year, they had a tough time managing the roof of an overhead tank. somebody vent inside and saw all sorts of unmentionables in the tank. that is the level of operational capability in mysore. that is why BVS’s note about expertise is important. This is what i gather from reading around and talking to some people who know. I might be wrong. Though I am pretty sure I am not. I was hoping BVS would talk about it from his experience of seeing these things from close range. I am not saying one should increase water supply. I am saying that Mysore’s and India’s population is increasing at such a rate that water as a resource is getting harder to harder for sharing. Unless the population increase is slowed down, Mysore’s and India’s natural resources will be put under such pressure that there come a period that the country’s very existence will be threatened. Any talk of pluming expertise becommes a side issue. social attitude. sure social attitude exists. but that it works similarly, if not exactly, all across the world. there are no utopias. the CT plumber i was talking about is sending all three of his kids to schools to be white collars. one is going to the snobbier than thou brown univ on a soccer scholarship, even. and just so that they could go to college, and have a better life they did, he and his wife have also run around and made sacrifices. what i am saying is instead of getting stuck with the intractable psychology of the problem(correcting attitude), it is better to solve the economics and science of the problem of vialibility of vocation. for example take beautician. because they have schools, training, and their products have a run in media etc. etc., it is now a viable career for middle class women and men. why have all sorts of people joined that line work? because the money is good, and they show certain level of professionalism. to complete the circle, the beautician is doing that job so that his kids can be the ones who are getting the manicure not the ones giving it. plumbing expertise needed to maximize utilization of existing water. all sorts of expertise needed to optimize all sort of solutions for all sorts of problems. iha loka knowledge and expertise very important, not only para loka. If water shortages occur as the demand outstrips supply because of rise in population, the terms maximisation, optimisation etc.. are of no help as the gulf between demand and supply is very huge. Plumbing skills are side issues here. The problem with educated Indians is that like politicians they close their eyes to the most fundamental and serious problem that confronts India- the population explosion, and argue around this. what can i do about population explosion? i cannot become unborn can i? i cannot go and tell anybody, noDamma kuDiyoke neerilla, nee haDi beDa. she will slipper me till become unborn, perhaps rightly too. our percapita consumption of water is low when compared to western countries. (actually order of magnitude low in comparison, but i forget the numbers. )* we should keep it that way. and maximize utilization of available water. * it will interesting to see if the comparison holds for cities also. We are falling into the trap India and China set for Western countries at conferences ( G8, Kyoto etc..) about climate change. China and India says that they want to industrialise too just like the West using resources which are at least comparable to per capita resources consumed in Western countries. That argument while seems rational at the first sight but when considered in the context of China with its 1.3 billion and India about 1 billion popultations against USA’s 250 million, UK 60 million and Germany 80 million populations. If resources are consumed at the Western per capita rate by these two countries, they will together destroy this planet Earth. completely agree. but consumption and production has always been associated with cool. and who does not want to be cool? which alive person does not want to improve quality of life? to connect this to this thread. its a good thing we have not developed a taste for a swimming pool in the backyard. we are still a front yard type of society. angaLa we put rangoli, and we relegate our hitlu to the back. this has consequences. this has to be the new cool, yet again.